Cleopatra Wong (Lee) is an Interpol CID agent tasked with getting to the bottom of a dastardly counterfeiting ring. As she travels around Asia, she gets into many precarious situations which involve her beating up/shooting the baddies. She and her cohorts finally trace the operation to a monastery in Manila. There she encounters counterfeiters so evil, they have imprisoned a bunch of nuns so they can continue their criminal operations. But Cleopatra Wong is on the case...so the bad guys better beware! Will she use her feminine charm, as well as her Martial Arts skill, to restore the currency and save the Asian economy? Find out today! Starting with the on-screen credit “And Marrie Lee as They Call Her Cleopatra Wong”, you know you’re in for a rollicking good time. Cleopatra Wong, the movie, will make you miss drive-ins. Even if you were born after a time when they were prevalent, you will still miss them. At least that’s what happened to us after seeing this. It conveys the whole drive-in vibe very well, and the 70’s fashions, decor, and music (and even the Martial Arts style) only serve to reinforce that. Of course, the plot only serves to set up a bunch of action scenes featuring Cleopatra, and thank goodness. 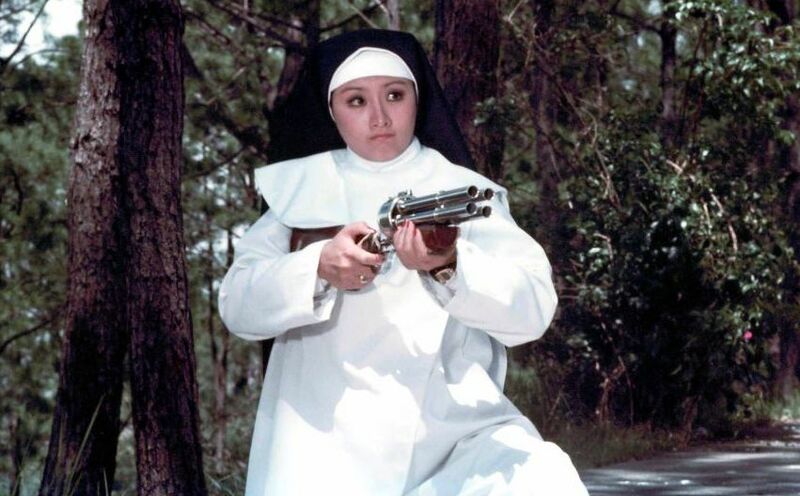 It never gets bogged down with unnecessary stuff, although the “dressing up as nuns” section before the climax does drag a bit (heh heh), and sinks into Blind Rage (1978) territory. But the movie pulls itself out of it for the final confrontation, where Cleopatra pops wheelies on her awesome motorcycle and shoots people with what can only be described as a “Supergun”. There’s nothing we like better than a disco scene, and even more so if it transitions from a karate scene. The dubbing is classically ridiculous, but how can you lose when, in a scene referring to the counterfeit money, the Chief says (well, more accurately, shouts) lines like “It’s too real to be fake!” - you just can’t make them like this anymore. Adding to the fun is 1 (one) exploding helicopter. So, yes, there is a slowdown in the final quarter or so of the film, but let’s not dwell on that. We should concentrate on the movie’s many positives, as listed above. Plus, the music by one Romeo Galang (who also is credited as co-writer) is memorable and very upbeat, which helps a lot. Producer/co-writer/director Suarez would follow this up with the superior and more serious-minded The One Armed Executioner (1983), and helpfully, Dark Sky has released both on a double-feature DVD that is well worth picking up. Your review of this movie made me add the DVD to my wish list on Amazon.com. I hope to get the DVD as a present for my upcoming birthday so I can review it on my web site. Keith B: Cool! Thanks. Looking forward to your take on it. RobotGEEK: Haha, it is silly fun. It's cheap to buy on Amazon. Thanks for the tip off. We'll add it to our list of reviews to review.